Summary: Malham Cove is lauded as the most spectacular example of a limestone pavement in the Yorkshire Dales and while I don't wish to detract from Malham there is another equally awesome example. 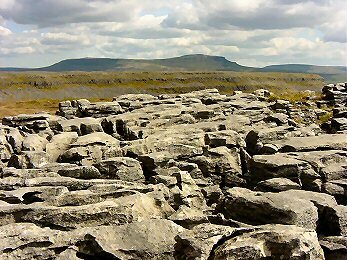 Not being as accessible as it's more illustrious cousin Moughton Scars is no less impressive and the view looking over the Scars from Long Scar with Pen-y-ghent in the distance is without doubt one of the most beautiful natural sights in the whole of the Yorkshire Dales. 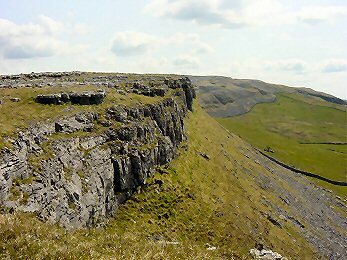 Moreover, Moughton Scars are larger in area than Malham Cove and simply tempt the walker to take a closer look. 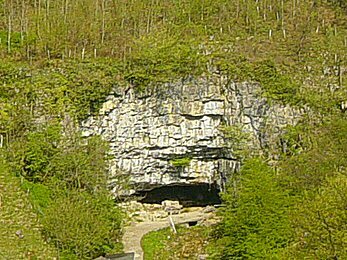 This circular walk from Austwick takes me on a walk along tracks past Ingleborough Cave and Trow Gill and then over superb limestone pavements. I had wanted to return to the Austwick area and explore Moughton Scars ever since I did my superb walk the previous year in Crummackdale when Norber Erratics had been my geological goal. During that walked I had looked over to Moughton Scars, instantly being enchanted by their beauty. There is something about limestone which just makes me gaze at it with awe and Moughton Scars struck me more than any other pavement had ever done. On that previous occasion I had been pressed for time and could not walk to the Scars. 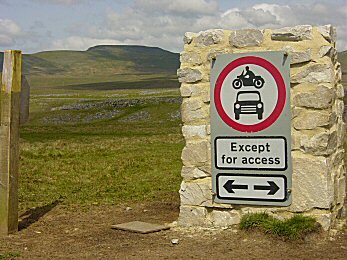 This time I was in no such constraints and as I drove over to Austwick for my walk I looked forward to a thrilling days walking. Moreover, the sun was shining brilliantly from the start and the clear views of Pen-y-ghent and Ingleborough which I got while driving along the Settle bypass got me gulping with anticipation. I was in for a great day. I had made an early start as I wanted to catch some spectacular scenery on film before the clouds bubbled up too much. Although the weather forecast was exceptionally good I often seem to get the only rogue cloud spoiling my best pictures. Not this time I resolved and I arrived in Austwick before 10am, one hour earlier than usual for this part of the Dales. (considering the city rush hour traffic) I changed into my walking boots while people tended their well managed gardens in this proudest of Yorkshire Dales villages. One elderly couple attracted my attention as they debated the best places to plant their annuals. The discussion was hilarious as the positioning of Pansy's and Marigolds resembled a political argument. I left the couple to it and set off out of the village past Austwick's only pub, the Gamecock and then up Town Head to cross a couple of fields before emerging onto Thwaite Lane. I followed the lane west and looked over to Robin Proctor's Scar on my right. Who was Robin Proctor? 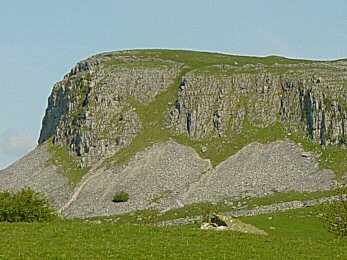 The scar is a marvellous example of a limestone cliff with banks of eroded scree below the cliff face. After following the track for just over a mile I left it to continue north along Long Lane track. Like Thwaite Lane the track is walled on both sides. Long Lane runs parallel to Clapham Beck which can be followed as an alternative if desired. 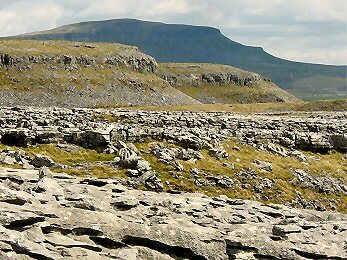 As I had followed the Clapham Beck path before I stuck to Long Lane and was well rewarded as I was provided with excellent vantage point views of first the entrance to Ingleborough Cave and then of Trow Gill. 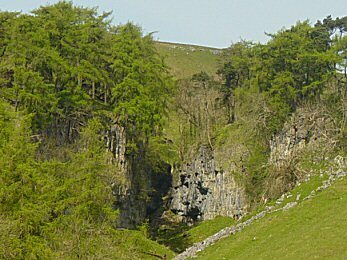 Just as I was preparing to take the photograph of Trow Gill a pair of RAF jets screamed over me at a very low altitude. Even though I had camera in hand they were gone in a instant. I was in a protected narrow valley with no warning of the impending attack. The jets were so close, so deafening and so quick. After regaining the abruptly shattered tranquility of the moment I moved on out of the head of Clapham Beck Dale and climbed up the cairn at Long Scar (SD765718) from where I gained my first views of Moughton Scars. From Long Scar I also has superb views of the Ingleborough range. The whole panorama from this spot is truly awesome - Don't take my word for it. Have a look for yourself. You will not regret it. This place is special. So much so that I took time out and sat down by the cairn...for ages and ages. After my very reluctant leaving of Long Scar I walked down to an outrageous sign on the high fell. I could not believe what I was looking at - a road sign stating no cars or motorcycles....EXCEPT FOR ACCESS. Unbelievable. What idiots in their right minds would want to deface these glorious fells by bringing motorised vehicles onto them. The sign took the **** - I walked on to recover sanity. I quickly forgot the denseness of the sight I had seen as I arrived at Sulber Gate/ Thieves Moss (SD776731) to begin my walk on Moughton Scars. The limestone scenery was incredible. and I gambolled on the path through the Scars from Thieves Moss to Beggar's Stile (SD777726) before following the path along the edge of the Moughton Scar's ridge to Capple Bank (SD782721). 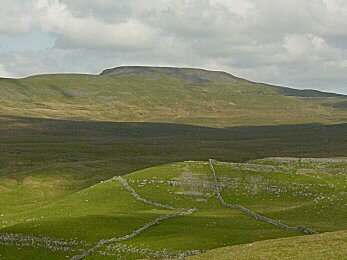 This was a most thrilling section of the walk with great views over the limestone to Pen-y-ghent and also great views over the ridge into Crummackdale. 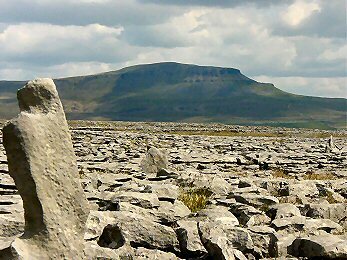 The varying condition of the limestone is notable - some sections are solid with large limestone avenues and others so broken that it close to walking on scree below a cliff face. Erosion is causing some of the Scars to seriously break down. The variation in stages of limestone breakdown make this an even more fascinating place. From Capple Bank the ridge breaks from southward to eastward which forced me round to Whetstone Hole Spring and off the limestone pavement down into Crummackdale at Hunterstye. 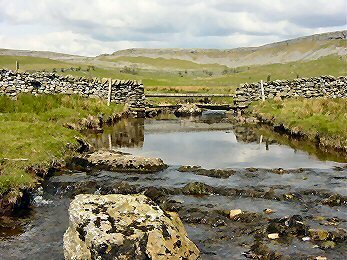 From here where Austwick Beck originates the walk takes on its last phase. Limestone is still much in evidence but there is much more lushness also as the deep greenness of the grass in Crummackdale fills the eyes. I followed a walled track into Crummackdale and made a crossing of Austwick Beck before crossing more lush fields now occupied by sheep and their lambs (it was mid May) near Sowerthwaite Farm. The fields still had many limestone outcrops and as I lost height more and more sandstone erratics tossed down from nearby Norber. It is just full of geological surprises on this walk, a fascination. After passing Sowerthwaite Farm I crossed over my last few fields and over Norber Sike before arriving back in Austwick at Town Head. I retraced my initial steps through the village which I had made over three hours earlier and wearily reached the car. I was very happy I had done this walk and one thing is for certain. I will be back to visit Norber Erratics and Moughton Scars.